The Ravenna Easel, crafted of seasoned elm, travels compactly as a sketchbox, and is approximately the size of a laptop computer. 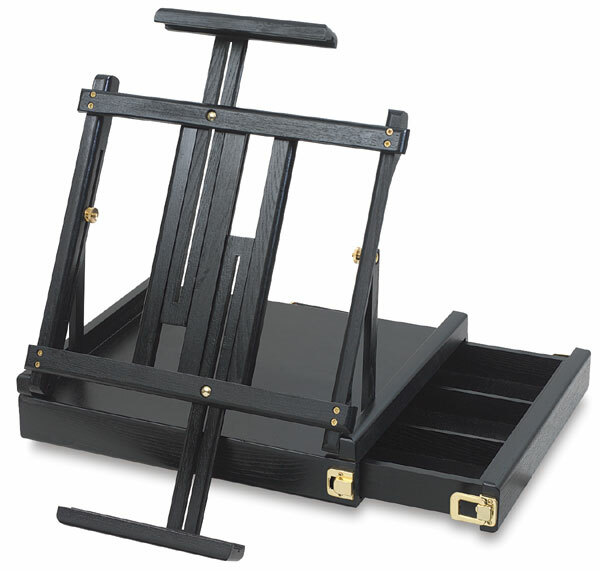 Place it on any flat surface, and the easel unfolds and expands to hold canvases up to 34" tall. Adjust the working angle anywhere from 0° to 90°. Ravenna's base has a convenient, locking side access drawer for securely storing plenty of paints, brushes, and other art supplies. Its sturdy construction, compact size, and very reasonable price make it an ideal choice both for travel and for tight home workspaces. A comfortable leather handle makes for easy transport.